Camp Simuni lies stretched along the very shore of the island of Pag, close to the small fishing village of Simuni. Among evergreen oak and pine trees and covering an area of 35ha, you’ll find 900 pitches and 200 mobile homes. Pag is also famous for its beaches that stretch around the island. Surrounded by 4km of pebbled beach, camp Simuni is no exception. There is also a 500m area of complete sandy beach, especially suitable for children. The beach is fenced, protecting the swimmers from sea scooters, boats, etc. 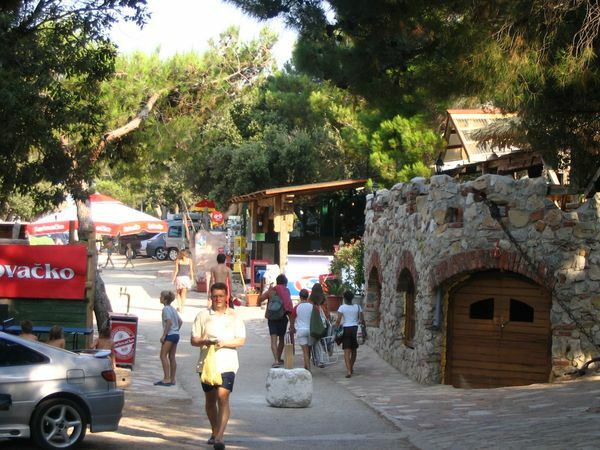 Camp Simuni is a small village of its own, with restaurants, cafe bars, a supermarket and much more. Just remember that not all shops are open during low-season. The camp has around 200 mobile homes, all of them close to the sea. There are three types of mobile homes, ranging from 20-32m2. It is also possible to buy your own mobile home and get it delivered to the camp. Parcels are situated across a beautiful area very close to the sea. The ground descends slightly towards the beach, so not just the front row will enjoys the view of the sea. Parcels come in two types (A & B) that vary in size and equipment. Both types has electricity and water connections, while type B also has a sewage system. Toilets and sanitary units: Disabled-access sanitary blocks, separate shower stalls, dishwashers, laundry machines. Food & drinks: Restaurant “Mali Raj“ offers international cuisine. You can get Italian, Spanish, Mexican, Chinese, and of course Croatian dishes. Mali Raj enjoys a good reputation due to the quality of the food and reasonable prices. 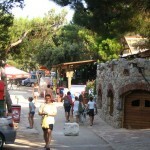 There is also a pizza restaurant on the camp, a rustic tavern serving traditional Dalmatian food and entertainment. If you prefer a burger and fries, there are fast food restaurants as well. Shops: Supermarket, fish market, pastry, tobacco shop, bakery, fruit store. Diving: If you wish to explore the underwater, the camp has its own diving school. Suited for experienced divers as well as beginners, it offers attractive excursions in the near region. Sunken ships and caves are not ment to be seen just on television! Here you have an opportunity to experience that in first person. Windsurfing: The strong winds make the area perfect for surfing sports. The windsurfing school offers lessons, as well as renting your own board. Anyone between 7 and 65 can attend the courses. Sailing: The camp has its own sail boat, “Biba“. Measuring 12.8m it can accommodate up to eight people at a time. With a professional skipper you can join Biba on an unforgettable cruise along the near coast. Other sports: .Camp has courts for basketball, soccer, tennis, volleyball and mini-golf. You can play table-tennis, do aerobic, aqua-aerobics, rent a pedal boat, kayak or bicycle. The camp offers lots of animation programs for your kids. Professional entertainers will take care of your children while you relax in the sun. There are various workshops and sports tournaments for both children and adults. The camps mini-club (2-6years) and kids-club (6-12years) are open every day of the week, so your kids will always have something fun to do. The Kids also love the game room, where they can play foosball, pinball, darts and much more. To get to camp Simuni, you take the new A1 motorway Karlovac-Split, before you reach Zadar exit in Posedarje to Pag (43km). Drive in the direction of Novalja, after ca 11km you will find Šimuni. If you come by the M2/E27 road (by the coast), then follow signs for the Prizna-Zigljen ferry, then choose direction Pag. The islands of Maun, Olib, Silba and Rab. Plitvice Lakes. 80km away, but to beautiful to miss! The “Pag triangle“. Mysterious stone formation discovered in 1999. Some say it’s an anscient UFO landing site. Whatever it is, it’s worth a look.